We all have a part of ourselves that knows how to feel at home in the world. Rewilding helps us connect with the natural, wild, intuitive aspects of who we are. This leads to a deep sense of place and of peace. Through learning the skills of our ancestors and living more simply and rooted to the Earth, we can rebuild connection with our own nature and with the wider natural world. Rewilding programs teach you how to connect with the undomesticated parts of yourself. We’ve experienced first-hand how powerful it can be to come back to nature. Particularly in this fast-paced world of multitasking and digital communication, it’s easy to feel a little lost and alone. But when we take the time to slow down and move at the pace of the wilds, a part of ourselves wakes up and comes alive. That part knows the world is interwoven in intricate and beautiful ways. 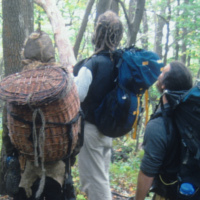 For this purpose, our rewilding programs teach ancestral skills and nature connection: as a way to remember who we are beneath the surface. One wonderful way to reconnect with nature and ourselves is through learning about plants. That’s why every spring for the past decade, we have gone out into the gorgeous Appalachian Mountains to forage on our Wild Foods Hike. 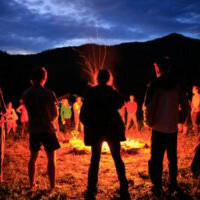 We spend three days gathering and enjoying edible plants, sleeping on the earth and cooking over a fire. During this rewilding program, we use all of our senses to connect with the world around us. The healing power of plants is something we all know deep in our bones. So, when we learn to identify, harvest, cultivate, and utilize medicinal plants, it’s deeply satisfying and empowering. Our ancestors all knew how to keep themselves healthy with herbs. Therefore we, too, can remember this wisdom through rewilding programs. In our wildcrafting class, we teach all you need to know to be able to wildcraft medicinal herbs, grow them in your garden, and make herbal preparations. 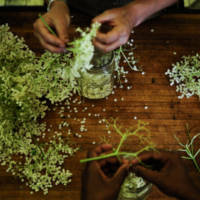 You’ll learn to make tinctures, salves, cough syrups, flower essences, and more. Sisters rewild together during a weekend of women’s primitive skills. There’s something special about coming together with other women to connect with our deepest selves. For this reason, we offer a weekend of Rewilding for women. It’s an opportunity to remember the roles that our female ancestors have held throughout time. Furthermore, this workshop is about being real with our lives as they are now. Together we find the threads that weave the two into our day to day realities. In this long weekend rewilding program, we gather together to work with our hearts and hands. We explore skills like basketry, felt making, firewood splitting, and more. Afterward, each evening, we gather together around a fire to share songs and stories, just as women have done for millennia. Permaculture courses that explore living off-grid in North Carolina. We offer two ways to earn your Permaculture Design Certificate. Both of them are infused with the essence of rewilding and have curricula that include off-grid living and ancestral skills. 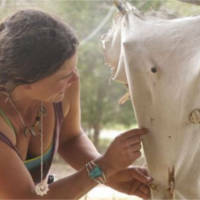 Our Earthskills and Permaculture Intensive is a long-term (one 3-day weekend per month for 9 months) rewilding program. In it we bring together primitive skills with modern sustainable living, all through the lens of permaculture. In fact, it’s our most comprehensive program, and we’re pretty excited about it. Our 10-day Permaculture Design Course is a more traditional PDC format. Yet, we can’t help but bring our students out into the wild places that we love during this one, too. Both of these rewilding programs use the language of permaculture to teach about the patterns in nature. When we learn to notice and listen to these patterns, we can live in harmony with them. Every year, we also welcome a few motivated individuals to become permaculture apprentices and live with us for a season. This is truly the most panoramic rewilding program that we offer. These folks experience living off-grid and get to participate in all of our classes and programs. Plus, we give small-group guidance to our apprentices and bring them out to our favorite wild places to observe, learn, forage and frolic. If you’re serious about rewilding, this could be the program for you. Learn to tan a hide and make buckskin, as our ancestors have done for millennia. Tanning a hide is a deeply rewarding and satisfying process. The resulting soft, supple buckskin can be made into clothing or bags, or used for lashing on baskets and other handmade crafts. Turning a raw deer hide into this timeless, useful material with the brain tanning process is hard work. It’s work that our ancestors did to survive and stay warm. There’s something in the doing of it that speaks to an ancient wild part of each of us. We teach how to tan a hide as part of our rewilding program so you can remember this connection with your own ancestors and their work and life.